The Vice President, Shri M. Venkaiah Naidu at an event to inaugurate the ICSI Centre of Excellence, in Hyderabad on September 16, 2017. The Deputy Chief Minister of Telangana, Shri Mohammad Mahmood Ali and other dignitaries are also seen. 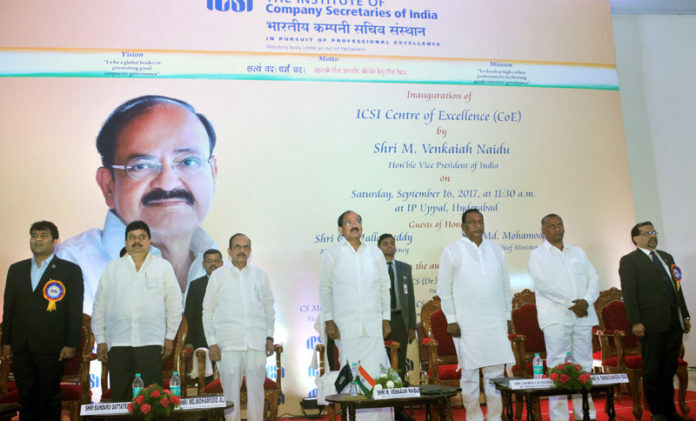 Hyderabad: The Vice President of India, Shri M. Venkaiah Naidu has said that strong foundation in ethical values should be the basis for exemplary corporate governance. He was addressing the gathering after inaugurating the Institute of Company Secretaries of India (ICSI) Centre of Excellence, in Hyderabad today. The Deputy Chief Minister of Telangana, Shri Mohammad Mahmood Ali and other dignitaries were present on the occasion. The Vice President said that it has become imperative for professionals like company secretaries to acquire cutting-edge knowledge and skills that are not only in tune with the best practices but also facilitate and promote good corporate governance. He further said that India with its inherent spiritual strength, rich traditions and strong value systems – which form the core of many family-run businesses – can emerge as a role model for other countries in corporate governance. The practitioners of corporate governance should play a leading role in making India a global leader in their field, he added. The Vice President said that money laundering through shell companies is one of the menaces that affect the economy of a country. 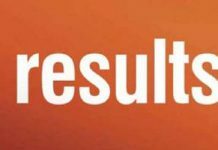 He commended the decision of ICSI to sensitize all its members and other stakeholders on the deleterious impact not only of the shell companies but also of shell NGOs. He also commended the decision of making ICSI employees to wear khadi one day a week and to have a corporate anti-bribery code in a voluntary manner. The Vice President said that a company secretary is not only the conscience-keeper of an enterprise, but he/she also has a larger social responsibility. He further said that they have to constantly update themselves with the changes in the laws for proper guidance of the management and other stakeholders. With the implementation of GST, they should be well equipped to deal with the challenges arising from its implementation, he added. “I am extremely delighted to be amidst you and inaugurate ICSI’s Centre of Excellence in this historic city of Hyderabad. With this Centre of Excellence catering to the entire South India and similar CoEs coming up at Ajmer for Northern region and at Kolkata for the Eastern region, the Institute will be meeting the requirements for the whole country. It’s Centre for Corporate Governance, Research and Training is already functioning at Mumbai and serving the Western region. In the wake of globalization and the increasing role of corporate in driving the economies, it has become imperative for professionals like company secretaries to acquire cutting-edge knowledge and skills that are not only in tune with the best practices but also facilitate and promote good corporate governance. Apart from setting the benchmark for high standards in corporate governance, such centres should accord high priority to research and innovative practices. I am told that its mandate, among others, is to undertake transformational research that aims to achieve international standing in corporate governance, build collaborative networks to address challenging research problems and achieve global competitiveness and gain recognition for Indian research. It should be remembered that a strong foundation in ethical values should be the basis for exemplary corporate governance. But before looking elsewhere for lessons in corporate governance, one should look inwards and what better than Kautilya’s Ardha Shastra. The principles and practices on economic management written by Kautilya in 4th century BC are relevant even now. I commend the Institute of Company Secretaries of India for coming out with a vision “to be a global leader in promoting good corporate governance” and a mission ”to develop high caliber professionals facilitating good corporate governance”. ICSI should ensure that these objectives do not remain as mere slogans and are achieved in the fullest measure. India with its inherent spiritual strength, rich traditions and strong value systems– which form the core of many family-run businesses—can emerge as a role model for other countries in corporate governance. The practitioners of corporate governance should play a leading role in making India a global leader in their field. Money laundering through shell companies is one of the menaces that affect the economy of a country. I commend the decision of ICSI to sensitize all its members and other stakeholders on the deleterious impact not only of the shell companies but also of shell NGOs. I also appreciate the efforts of ICSI in bringing secretarial standards on to statute books and paving the way for good corporate practices. Such standards are needed in the wake of corporate disputes. A company secretary is not only the conscience-keeper of an enterprise, but he/ she also has a larger social responsibility. No doubt, company secretaries are key managerial personnel, but they also represent internal and external stakeholders and as such play a pivotal role in ensuring compliances and implementing principles of good governance. They have to constantly update themselves with the changes in the laws for proper guidance of the management and other stakeholders. With the implementation of GST, they should be well equipped to deal with the challenges arising from its implementation. I am happy to note that ICSI is in the process of framing an international corporate governance code by bringing forth the teachings of the ancient Indian texts which hold relevance in the modern day corporate scenario. I also commend the Institute for submitting a draft note on model code for meetings of Panchayats, which aims to promote good governance at the grass-roots levels. The other initiatives such as making ICSI employees to wear khadi one day a week and to have a corporate anti-bribery code in a voluntary manner are also laudable. I wish the institute, all its members and students a wonderful journey ahead.